Who made the Tower of London? The first part of the Tower of London to be built was the White Tower. It was probably begun in 1078 and finished by 1100. The new tower was designed by a Norman bishop called Gundulf, who was a famous builder. White limestone was brought from Caen in ships to build the Tower and a local stone called Kentish ragstone was brought by barge along the Medway and the Thames. When it was completed the White Tower stood 90 feet high. Its walls were 15 feet thick at the bottom and tapered to 11 feet thick at the top. The entrance was on the first floor. About 1097 William Rufus built a stone wall around the White Tower to enclose it. For centuries the Tower of London was used to hold important prisoners. The first was Rannulf Flambard the Bishop of Durham. When an arrow in the New Forest killed William Rufus in 1100 his brother became Henry I. The new king promptly arrested the bishop for simony (selling positions in the church for money). In 1238 Henry began building a new curtain wall. Several towers strengthened the new curtain wall. 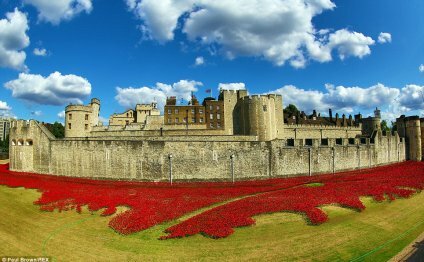 The Bloody Tower was originally called Garden Tower because of an adjoining garden. There was also Broad Arrow Tower, The Constable Tower, The Martin Tower, The Brick Tower, The Flint Tower, The Bowyer Tower (a bowyer was a man who made bows), the Salt Tower and The Devereux Tower. (The Devereux Tower is named after Robert Devereux (1566-1601) who was a prisoner in the Tower and was executed. Henry's son Edward I (1272-1307) continued his father's work. He built the Beauchamp Tower. Edward also built St Thomas's Gate. It had an entrance from the river. Originally it was called Water Gate but in time it became known as Traitor's Gate because so many people accused of treason passed through it. Edward I also built Byward Tower, Well Tower and Develin Tower. He also built another curtain wall around the existing curtain wall. So the Tower of London now had two concentric walls surrounding it. Edward I also established a mint in the Tower of London. It finally closed in 1968. The Cradle Tower was built in the late-14th century shortly before the Peasants Revolt. In May 1381 an army of rebel peasants from Kent led by Wat Tyler marched on London. More rebels from Essex marched on the city from the east. The rebels entered London, helped by sympathizers who opened the gates for them and the king and his minister took refuge in the Tower of London. Finally the king went out to negotiate with the rebels. While he was away some angry peasants entered the Tower and ransacked it. The Archbishop of Canterbury and the Treasurer Sir Robert Hales were both beheaded. However the king eventually persuaded the rebels to disperse by making them promises, which he did not keep. met the same fate. Anne Boleyn followed them in 1536. Thomas Cromwell was sent to the Tower and executed in 1540. Then in 1542 another of Henry's wives, Catherine Howard was beheaded. Meanwhile during the 16th century England was rocked by religious changes. Henry VIII made himself head of the Church of England in 1534. His son Edward VI (1547-1553) introduced Protestantism. However it soon became clear that the young king would not live long and his sister Mary who was a Catholic and who would restore Catholicism would succeed him. To try and prevent that the king named Henry VIII's great-niece Lady Jane Grey as next in line to the throne. Edward agreed to this but after his death many people supported Mary and she easily captured Lady Jane. The unfortunate young woman was beheaded on 10 February 1554. In 1603 Sir Walter Raleigh was convicted of treason and sent to the Tower. He was held there for 13 years. Raleigh used the time to write a History of the World. He also experimented with chemistry. However in 1616 he was released because the king wanted him to lead an expedition to South America. The expedition was not a success and in 1617 Walter Raleigh was rearrested and sent back to the Tower. He was beheaded on 29th October 1618. Charles II (1660-1685) strengthened the Tower's fortifications. Furthermore New Armouries was built in 1663-1664. Furthermore during the reign of Charles II members of the public were allowed to visit the Tower of London for the first time. Video on topic: Who made the Tower of London? Sir Robert Tichborne (ca. 1610–1682), was an English soldier who fought in the English Civil War. He was a regicide of Charles I. Sir John Robinson, 1st Baronet, of London (10 January 1615 – February 1680) was an English merchant and politician who sat in the House of Commons between 1660 and 1667. He was Lord Mayor of London in 1662.